Great Northern Tiling Company have used UltraTileFix to install over 3,000m² of wall and floor tiling at the Mercedes-Benz Showroom in Central Birmingham. 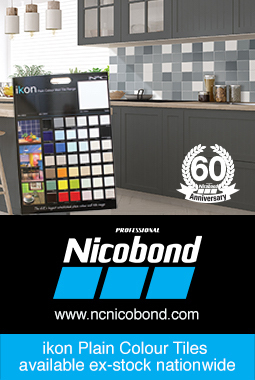 The showroom required new wall and floor tiling throughout the branch in order to retain the high standards that its customers expect. The Great Northern Tiling Company (GNTC) – TTA members and skilled tiling contractors with almost 20 years experience in the commercial sector – secured this exciting project and used UltraTileFix materials to complete the job. Before any floor tiling could commence, GNTC needed to prepare the substrate by priming the entire area with ProPrimer, an advanced polymer primer for exceptional bond and multiple substrates. Designed for both porous and non-porous substrates, ProPrimer enhances the adhesion of all UltraTileFix floor levellers and is proven to reduce substrate porosity. Once ProPrimer had been applied and fully dried, GNTC used ProLevel Fibre reinforced flexible floor leveller to create a strong, sound and even base, ready for tiling to commence. A single part, high strength, rapid drying and curing concrete floor leveller, ProLevel Fibre boasts a 3 hour set time and can be tiled after just 8 hours, an important feature for projects where downtime needs to be kept to a minimum, such as this one. What’s more, ProLevel Fibre has been formulated using FibreBond Technology, a process which involves the addition of fibre particles for superior strength, creating the ideal substrate to support the weight of the cars on display in the showroom and the constant footfall of visitors. Completing the project, GNTC used ProFlex SP and ProFlex SPES adhesives to fix 2,621m² of floor tiles and 400m² of wall tiles throughout the showroom. ProFlex SP rapid set flexible tile adhesive and ProFlex SPES standard set flexible tile adhesive are both classified as S1 in accordance with EN 12004 and have a high level of deformation for greater tolerance to movement. The S1 properties of ProFlex SP and ProFlex SPES make them the perfect choice for timber floors, swimming pools and underfloor heating systems. ProFlex SP and ProFlex SPES, along with every other product available from UltraTileFix boasts a lifetime guarantee, giving you complete confidence that UltraTileFix products are designed to last. For further information on UltraTileFix’s range of adhesives, grouts, floor levellers and ancillary products, email ultratilefix@instarmac.co.uk or call 01827 254402. Since its launch in Spring 2010 Tilezine has rapidly become the place to hear the latest breaking news. Since Tilezine was launched the number of human visitors to tilezine.co.uk is now averaging over 2200 per month.